This reprint of a 1921 book is accepted by many as one of the few basic resources available for serious study of Cherokee genealogy, history, legal documents, and biographical information on leaders and old families. Forty portraits of prominent Cherokees and other old photos of that time period are included. The book also covers several prominent Cherokee family trees, which makes this an excellent resource for Cherokee genealogy researchers. About the Author: Cherokee historian, genealogist, and physician, Emmet Starr was born December 12, 1870 in Going Snake district, Cherokee Nation, Indian Territory. He attended Cherokee public schools and graduated from the Cherokee Male Seminary in 1888. He began collecting Cherokee documents in the early 1890s. Starr briefly practiced medicine before dedicating himself to the study of Cherokee history. He died January 30, 1930 and is buried in Claremore, Oklahoma. He was inducted into the Oklahoma Historians Hall of Fame in 1997. All Things Cherokee Recommendation: What makes this text so special is its age and immediate relevance to the Cherokee Nation at the time of Dawes enrollment. Dr. Starr was born in 1870 in Going Snake district, Cherokee Nation, Indian Territory. He began collecting Cherokee genealogy and historical documents in the early 1890s, and was extremely active in researching the genealogies of several prominent Cherokee families. 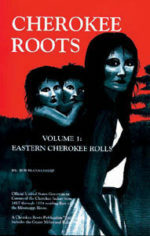 This book includes a good deal of history, as well as biographies of Cherokees, and detailed Cherokee genealogy information including the family trees of several old Cherokee families. It’s an invaluable resource which I frequently reference in my research.